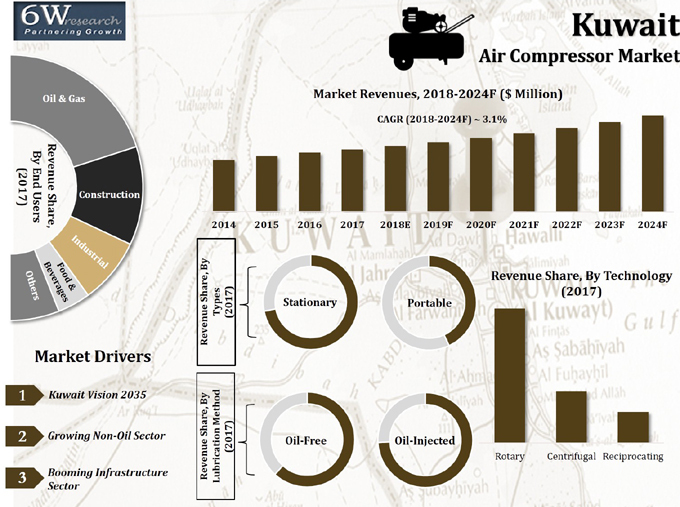 Kuwait air compressor market is gaining pace on account of upcoming infrastructural projects in the oil & gas sector, industrial development as well as an overall growing construction sector in the country. The government of Kuwait is focusing on strengthening the economy by investing heavily in the non-oil and gas sector, which would ultimately spur the growth of the industrial segment in the country, resulting in an increase in the demand for air compressors in the industrial domain in the coming years. According to 6Wresearch, Kuwait air compressor market size is forecast to grow at a CAGR of 3.9% during 2018-24. Major drop in oil prices in 2014 led to the downfall of the oil & gas industry in the country, resulting in a negative growth of Kuwait air compressor market. The stabilizing of oil prices and the increasing role of non-oil sector is expected to lead to positive growth of Kuwait air compressor market in 2018. The ambitious Kuwait Vision 2035 Plan, which aims to diversify the economy, is revitalizing the construction market in the country. Ongoing and upcoming infrastructural advancement in Kuwait is further escalating the demand for air compressors in the country. In Kuwait, rotary air compressors captured majority of the Kuwait air compressor market share in 2017, and the segment is expected to dominate the overall market during the forecast period as well. The oil & gas application segment accounted for the maximum revenue share in the overall air compressor market on account of the several upcoming oil and gas projects. Kuwait air compressor market report thoroughly covers Air Compressor market by types, technology, power rating, lubrication method, applications, and regions. The Kuwait air compressor market outlook report provides an unbiased and detailed analysis of Kuwait air compressor market trends, opportunities/high growth areas and market drivers, which would help the stakeholders to decide and align their market strategies according to the current and future market dynamics. 16.3. Doosan Infracore Co. Ltd.